San Diego city officials opened the fourth new fire station this year on Monday, a two-story building that will serve Hillcrest and surrounding neighborhoods. “After decades of neglect by past city leaders, we’re finally moving our city forward and delivering the projects our residents have been clamoring for,” he added. The 10,731-square-foot station includes two-and-a-half apparatus bays, nine dormitories, a kitchen, day room, watch room, exercise room and lounge. The bays house a fire engine, a battalion chief vehicle and a utility vehicle. The dormitories sleep one battalion chief, two captains and six firefighters. 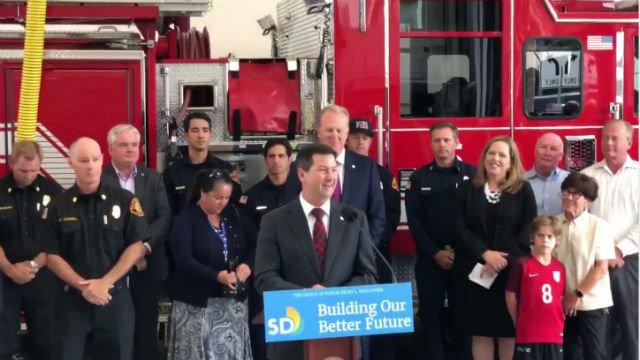 Faulconer was joined at the dedication by City Councilmember Chris Ward, who represents the district, and Assemblymember Todd Gloria, who pushed for the station while serving on the council. “Fire Station 5 will provide Hillcrest and the greater Uptown community with much needed and deserved public safety resources and personnel,” said Ward. The new facility 3920 Ninth Avenue replaces at an aging station built in 1951. New stations were opened in City Heights in February, Little Italy in June and Pt. Loma in July.